When it comes to my hair…. Yah, it’s very difficult. My hair is so dry, damaged, unmanageable and I also have curls. Like I said my hair is difficult! And finding the perfect products is even harder… Because I really love my curls but the most products make my hair heavy… So then it’s bye bye pretty curls… Therefrom I’m always trying out new products. 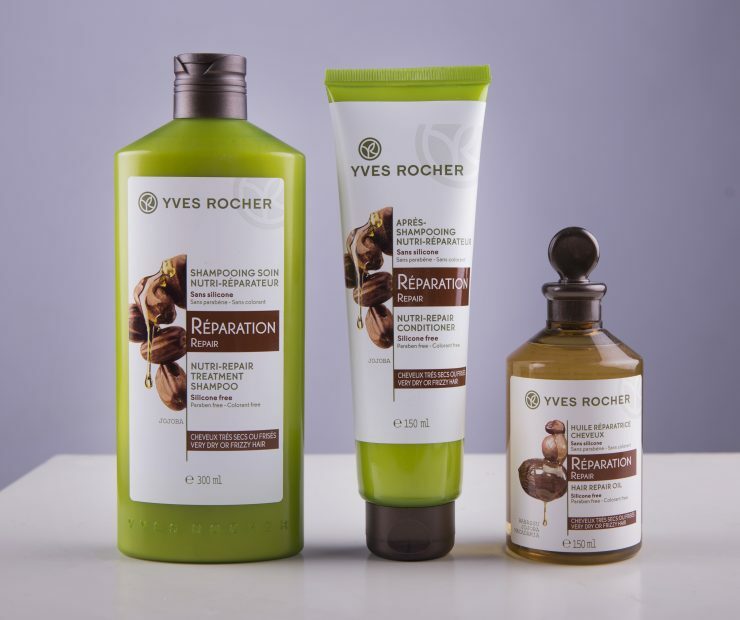 And this time I’m trying out the yves rocher nutri-repair hair caring products. These would take care for a nurturing and recovering. The products are made from jojoba oil and don’t contain parabens, silicones and dyes. Are you curious how good these hair products are? This shampoo has a thin structure and it smells so good, it’s a bit sweet but mainly nutty scents. It’s a good foaming shampoo that is easy to wash of. It makes my hair extremely soft, smooth and it remains to stay airy. I can use this shampoo without any conditioner because it really takes good care of my hair. But the best part is that my curls looks so much better when I use this shampoo! It’s an good shampoo for (very) dry, damaged and or hair with curls. It gives my hairs such a beautiful shine and it stays airy! The conditioner has a thicker and creamy texture. It also has the same good smell as the shampoo! I use this conditioner 1 till 2 times a week, and I let it stay in my hair for 3 minutes. The conditioner is also easy to wash of and you can directly feel that your hair is super soft. Also this conditioner don’t make my hair heavy but it does make it look good and healthy! This conditioner can give my hair that extra that it need! And when I want to take extra care of my hair I use this oil. I use it mostly 1 time a week our ones in the two weeks. You bring this oil on, on dry hair and you let it stay for 10 till 20 minutes. Then it’s time to wash your hair very well with the shampoo. And if you got a dry scalp you can perfectly use it for that! But then you need to wash it off very good! This oil makes my hair soft, smooth and health! Yes, this is the perfect treatment to give your hair some extra care. Left you can see my hair before I washed it and right when I used the shampoo, conditioner and the oil. My hair looks so much better on the right! I really love what it does with my curls! My curls look so much better and my hair looks good and healthy again! I just love these hair products, they are just amazing! My hair is healthy, smooth and soft. It also makes it airy and my curls look much better now. Like I said these products are so good! These are the perfect products when you have curls or (very) dry hair! Your hair looks amazing with these products. They are great! Ik heb de olie vroeger ook al gehad en het is echt een hemels product! Ja, deze is echt super goed he! Wauw, je krullen zien er inderdaad veel mooier uit! Deze lijn klinkt erg fijn. De haarproducten van Yves Rocher ruiken altijd superlekker. Ik heb ook zo’n onhandelbaar haar dat snel droog en beschadigd is. Ik heb al zoveel producten geprobeerd maar nog niets gevonden wat op lange termijn goed helpt. Ja ik snap je want producten vinden dat op lange termijn goed helpen zijn moeilijk.